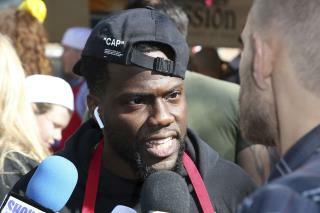 (Newser) – The Academy of Motion Picture Arts and Sciences ended up looking for a new host for the 91st Academy Awards less than 36 hours after naming Kevin Hart for the slot. The comedian, who had faced a major backlash over homophobic tweets from 2011 and earlier, announced Thursday night that he would no longer be doing the job he had described as the "opportunity of a lifetime," TMZ reports. "I do not want to be a distraction on a night that should be celebrated by so many amazing talented artists," he said. "I sincerely apologize to the LGBTQ community for my insensitive words from the past." He added: "I'm sorry that I hurt people ... I am evolving and want to continue to do so." Does anybody watch the Oscars anymore I sure don't not for the last years. The movies are utter crap there's no one to like in Hollywood anymore. Talent nobody has talent. Everybody in Hollywood is a complete MORON and IMBECILE. They all look and sound like each other. How many remakes, sequels or prequels can you do? There hasn't been an original in Hollywood movie in the last 20 years. The world ?? is TOTALLY RIDICULOUS and cannot seem to accept an apology, then MOVE ON ! ! ! The world ?? is like a dog ?? with an old sock ? ?, they cannot seem to just let it go. If you just raise your eyebrows, speak in a wrong tone or firmly state you are a Christian and adhere to Bible standards, you are considered a bigot, hater and possibly a Social pariah, because you don’t go along with this “Inclusive & Progressive “ world ?? . Of course, with the arrogance and overconfidence of this world ? ?, based on their education, job, financial status, social status, political status and materialistic status, also, if you don’t compromise your faith and values, just to go along with what the world ?? approves of, you are alienated and segregated out from what they consider the “normal” people. So be it, who wants to be part of a dying ?? world ?? , anyway ? It serves him right for attacking Trump because he was pressured to do so. Wimp! Nobody except the Hollywood jock sniffers watch that crap anyway.